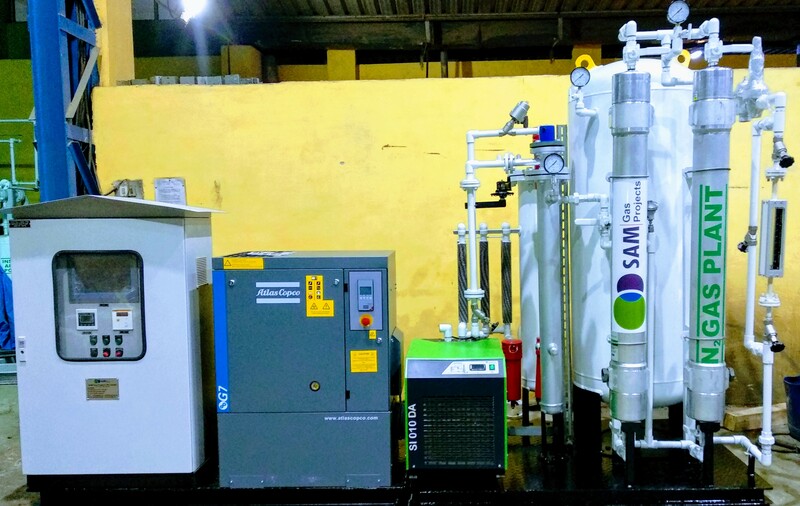 Membrane Nitrogen Gas Generators is regarded as an emerging gas separation technique in the industry due to the lower cost in both initial capital and energy consumption, if compared to cryogenic distillation and pressure swing adsorption. The typical design of the membrane gas separation technique is that the air is drawn from the ambient into the membrane module and the targeted gases are separated based on the difference in diffusivity and solubility. In the membrane module, oxygen will be separated from the ambient air and collected at the upstream due to the high diffusivity, whereas nitrogen will be collected at the downstream of the module. Cost-effective gas supply Standard, pre-engineered product range. Less power consumption hence low operating cost. No moving parts thus negligible maintenance is required. Highly skidded, modular design ready for installation supplied from factory. Fully automated controls for unattended operation. Fast start up time to run plant in full load. 10 years or more then, of the system. Flow Range – Membrane Nitrogen Generators are suitable for nitrogen flows from 15 nm3/hr to 2500 nm3/hr. Nitrogen Purity – Purity from 95 to 99.5 % is easily achievable by Membrane Nitrogen oxygen generators, with balance mostly being a mix of inert gases such as oxygen and argon. For higher purities than 99.5% please see our PSA Nitrogen Systems. Pressure – Our Membrane Nitrogen oxygen generators can deliver nitrogen directly at 7barg to 20 barg without an additional booster, making is suitable for most applications. If higher pressure is required by the customer process or for storage, then we supply an additional booster. – Dew Point – Our Nitrogen generators deliver very dry gas, with dew points as low as (-) 65°C or better. Food Packaging – Nitrogen is used to displace oxygen in food packaging. By eliminating the oxygen, the food can last longer. It can also add a cushion around the food to keep it safe from breaking in transport. Light Bulb Production – In incandescent light bulbs, nitrogen gas is often used as a cheaper alternative to argon. Chemical Plants – Nitrogen is used to displace oxygen and prevent explosions in highly dangerous atmospheres, such as chemical plants and manufacturing facilities. Tire Inflation – Nitrogen offers many benefits when used to fill tires, such as giving them a longer life by reducing oxidation. It also improves tire pressure retention to give drivers better gas mileage. Electronics – When electronics are being assembled, nitrogen gas is used for soldering. Using nitrogen reduces the surface tension to provide a cleaner breakaway from the solder site. Stainless Steel Manufacturing – By electroplating the stainless steel with nitrogen, the finished product is stronger and resistant to corrosion. Pollution Control – Nitrogen gas can be used to remove the VOCs in liquids before they are discarded. Pharmaceuticals – Almost every major drug class contains some nitrogen, even antibiotics. Nitrogen, in the form of nitrous oxide, is also used as an anesthetic. Mining – In the mining industry, nitrogen gas is used to quickly extinguish fires by eliminating the oxygen from the air. And when an area is going to be abandoned, they use nitrogen to ensure the area will not explode.